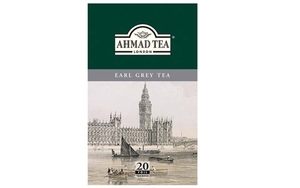 Ahmad Tea Earl Grey Tea in 1.41oz (40g) pack. Contains 20 foil-wrapped tea bags/ box. Our Earl Grey is a select blend of our finest teas, lightly scented with the elegant flavour of bergamot. This gives it the aromatic, refreshing character that balances the invigorating briskness of the tea with a bright fresh citrus taste. Enjoy one of our most popular afternoon teas with a slice of lemon to capture the top notes or indulge with delicious creamy desserts or lemon cakes and tartlets. Best served without milk. A cup of our Earl Grey can also be enjoyed in the evening with our Decaffeinated Earl Grey. Product of United Kingdom.